O God, who by the preaching of thy servant Columba didst cause the light of the Gospel to shine in Scotland: Grant, we beseech thee, that, having his life and labors in remembrance, we may show forth our thankfulness to thee by following the example of his zeal and patience; through Jesus Christ our Lord, who liveth and reigneth with thee and the Holy Spirit, one God, for ever and ever. Amen. O God, who by the preaching of your servant Columba caused the light of the Gospel to shine in Scotland: Grant, we pray, that, remembering his life and labors, we may show our thankfulness to you by following the example of his zeal and patience; through Jesus Christ our Lord, who lives and reigns with you and the Holy Spirit, one God, for ever and ever. Amen. This commemoration appears in Lesser Feasts & Fasts 2018 with revised lessons & collects. In the troubled and violent Dark Ages in Northern Europe, monasteries served as inns, orphanages, centers of learning, and even as fortresses. The light of civilization flickered dimly and might have gone out altogether if it had not been for these convent-shelters. 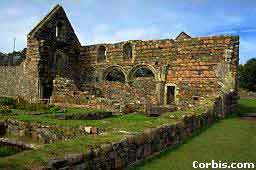 Columba, a stern and strong monk from Ireland, founded three such establishments. He founded the monasteries of Derry and Durrow in his native Ireland, and the island monastery of Iona on the coast of Scotland. Iona was the center of operations for the conversion of the Scots and Picts, and became the most famous religious house in Scotland. There Columba baptized Brude, King of the Picts, and later a King of the Scots came to this Abbot of the "Holy Isle" for baptism. The historian Bede tells us that Columba led many to Christianity by his "preaching and example." He was much admired for his physical as well as spiritual prowess. He was a strict ascetic and remained physically vigorous and unflagging in his missionary and pastoral journeys throughout his seventy-six years of life. The memory of Columba lives on in Scotland, and Iona, though desecrated during the Reformation, today houses a flourishing ecumenical religious community. A Medieval work by a successor of Columba, Adamnan's Life of St. Columba, is online, should you desire more information. Some photos of Iona, taken by the web author in June 2002, are online.